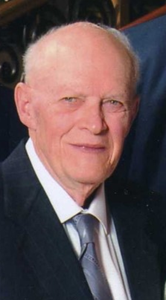 GUILDERLAND- Gerald W. Hoffstetter, 87, passed away on Monday, February 4, 2019. Gerald was born in Saint Louis, MO, on October 31, 1931 to the late Wilbert and Esther (Kaspar) Hoffstetter, and grew up in Broken Arrow, Oklahoma. Gerald served his country honorably in the United States Army Signal Corps. during the Korean War. After basic training, Gerald married the love of his life, Hilda Roady. They were married on April 18, 1954. This April they would have celebrated their 65th wedding anniversary. Together they raised two children. Gerald was a graduate of Missouri School of Mines at Rolla, with a degree in Chemical Engineering. He was a member of Beta Sigma Psi fraternity. He was a member of the Guilderland Elks Lodge for nearly 21 years. Gerald retired from NYS Office of Energy as a Senior Computer Programmer in 1995. Gerald will be remembered for his love of rock collecting, traveling, photography, camping, and his time in the Boy Scouts. His passion in life was his family. Gerald is predeceased by his brother, Gary (Barbara) Hoffstetter, his brother-in-law, Howard Roady, and his sister-in-law, Frances Mueller. He is survived by his beloved wife, Hilda, his children, Michael (Brenda) Hoffstetter, and Kathryn (Tim) Runey, his grandchildren, Adam(Emilia) Runey, and Makayla “Aubrey” Runey, his sister, Gerry (Russ) Rhoades, his brother-in-laws, Phil (Deanne) Roady, and Edwin Roady. Calling hours will be held at New Comer Cremations & Funerals, 343 New Karner Road, Albany, NY 12205, on Monday, February 11, 2019 from 5:00pm-7:00pm. A funeral service will be held at Messiah Lutheran Church, 2850 Guilderland Ave., Rotterdam, NY 12306, on Tuesday, February 12, 2019 at 10:00am. Burial will be held at Gerald B.H. Solomon, Saratoga National Cemetery, Schuylerville, NY. In lieu of flowers donations may be made in Gerald’s name to Messiah Lutheran Church, 2850 Guilderland Ave., Rotterdam, NY 12306. Add your memories to the guest book of Gerald Hoffstetter. Gerald was one of my very favorite alumni during my time as Executive Vice President of the MSM-UMR Alumni Association. We kept a lively conversation going via email about his time in Rolla as a student at the Missouri School of Mines, sharing history and photos of the era. Having grown up in Rolla and attended the same university, his memories were precious to me. I was most fortunate to visit with Gerald and Hilda when they visited Rolla. I have missed hearing from him in recent years, although Hilda explained why. I know his family will miss him very much, as will I. Rest in peace, dear friend. Prayers(Roseries) and prayers for Gerald and Hilda and family. Sincerely sorry for his passing. Loved Gerald and Hilda, loving Louisiana friend Pat Melancon looking for you to visit . Hi Gerald. I’m writing this with the idea you are here in spirit. Remember when we left St.Louis for the little town of Broken Arrow. We lived on a farm. You had the chore of cleaning the dairy barn and I had to gather the eggs and help Mom in the house. When it would turn COLD Dad would get out the sled, tie a rope on it and spin us around on the pond. It was lots of fun. Also remember Ribbon and the fun you had riding him. I was always too scared. Then we ended up moving to Jerseyville and you tried your hand at magic. Iflubbed up. Some Sis you had!!!! When we moved to Fieldon we were living in the country again. I enjoyed being the maid of honor for Hilda three times almost 66years ago—once in Jerseyville where you had to buy the license, then in Staunton for the beautiful church wedding and finally for your fiftieth anniversary. I paid you back by making you walk me down the aisle for my wedding. A wonderful vibrant man that loved his stories!! All the stories of growing up, school, and being in the military. Although many of the stories were repeated, they were alway so full of life. He is missed but oh so loved. I met your Mom and Dad in 1994 at a First Cousin Reunion after Ron and I got married. A few years later, I was responsible for the program at another of those reunions. Your Dad won the prize (a big family picture) because he could name all the Schmutzlers in that picture! He was so happy. Family meant a lot to him. He will be missed. Ron and I both send our love to all of you during this sad time. I think some of my favorite memories of Uncle Gerald are when I was young. He and Uncle Gary would come back from hunting in the creek beds of Fielden, Il with beautiful Geodes.